Map It! Okinawa: "Scenic View on a Shioya Hilltop, Ogimi Village"
Shioya is a small town in Ogimi Village. It lies on the outskirts of Shioya Bay. The hilltop that you see above pretty much lies in the center of the town and has a wonderful view of the bay and the town itself. 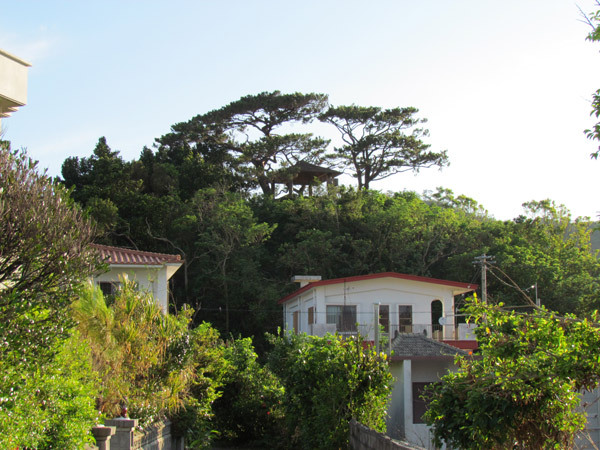 At the top of the hill you will see an utaki and then a large cabana-type structure. At the corner of this cabana-like structure you will see a pedestal holding a large rectangular brick stone facing south with a giant hole punched out in the middle. The inscription reads, "Okinawa Tourist Spot, Shioya Bay, Appointed, April 1, 1978, Okinawa Prefecture, Tourism Development, Ryukyu Shimpo". 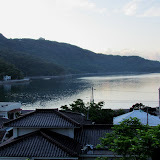 Every year around August, three towns around the Shioya Bay (Shioya, Yako, and Taminato) participate in a festival known as the "Unjami Matsuri". One of the main attractions at this festival is the dragon boat race. Each town puts forth two dragon boats and they race from one end of the bay finishing up in the town of Shioya. See also Mike's Ryukyu Gallery. If you look to the north from the Shioya Hilltop, you may see a set of concrete stairs disappearing up to the hills. This will take you to the Ogimi War Memorial. Parking. You will have to find open areas to park. Roads in this neighborhood are narrow. There is one public parking area marked by the Green Thumbtack. You can park there and walk to stairway leading to the Shioya Hilltop. Restrooms. Near the Green Thumbtack is a public restroom. Other places of interest nearby: The Ogimi Waterfall, The Ogimi War Memorial.